After two weeks away from the blog, I’m back! At the end of July, I attended an interesting event at UC San Diego’s Arthur C. Clarke Center for Human Imagination. (Yes, that’s what it’s called!) The event was a panel discussion entitled, “How Big is the World? 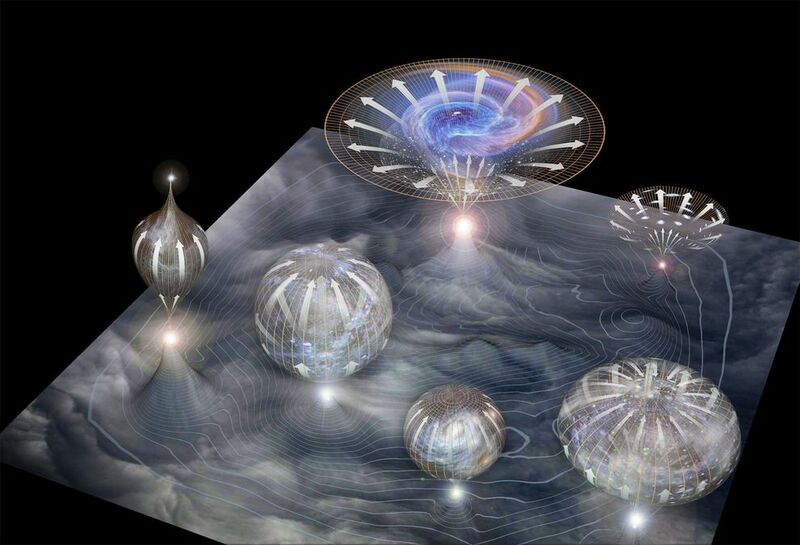 : Exploring the Multiverse in Modern Astrophysics, Cosmology, and Beyond” (and you can watch the event here). The three speakers included Andrew Friedman (postdoctoral fellow in astronomy at MIT), Brian Keating (professor of physics in my department at UCSD), and David Brin (Hugo & Nebula Award Winning Author). The Clarke Center seems to be a unique place with an ambitious program that incorporates a variety of “transdisciplinary” activities. This event fits with their nebulous theme, and the talks and discussions frequently overlapped between science, philosophy of science, and science fiction. I think science and philosophy of science go well together especially when we’re exploring the edges of scientific knowledge, including cosmological astrophysics and the origins of human life. (See my previous post and this recent article on Salon.) Too often astrophysicists, myself included, become very specialized and neglect the “big questions.” Nonetheless, I think we should be careful when we traverse the border between science and science fiction: while it’s exciting to connect them and useful for public outreach, we should mind the gap. Andrew Friedman focused on the “multiverse”. What is a multiverse, you ask? I’m not entirely clear on it myself, but I’ll try to explain. In the first fraction of a second of the Big Bag, the universe appears to have gone through a phase of accelerated, exponential expansion (called “inflation”) driven by the vacuum energy of one or more quantum fields. The gravitational waves that were recently detected by BICEP2 (in which Brian Keating was involved) appear to support particular inflationary models in which once inflation starts, the process happens repeatedly and in multiple ways. In other words, there may be not one but many universes, including parallel universes—a popular topic in science fiction. Inflationary theory solves some problems involving the initial conditions of the Big Bang cosmology, but I’m not so sure that we have—or can ever have—evidence clearly pointing to the existence of multiverses. In addition, in my opinion, Friedman stretched the concept of “universe” to try to argue for the multiverse. He spoke about the fact that there are parts of the universe that are completely inaccessible even if we could go the speed of light, but that doesn’t mean that the inaccessible regions are another universe. It’s fun to think about a “quantum divergence of worlds,” as David Brin referred to it, but quantum mechanics (with the standard Copenhagen interpretation; see this book by Notre Dame professor Jim Cushing) don’t imply a multiverse either: Schrödinger’s live cat and dead cat are not in separate universes. As far as I know, I’m not creating new universes every time I barely miss or catch the train. The speakers did bring up some interesting questions though about the “anthropic principle” and “fine tuning.” The anthropic principle is a contentious topic that has attracted wide interest and criticism, and if you’re interested, read this review of the literature by Pittsburgh professor John Earman. The anthropic principle is the idea that the physical universe we observe must be compatible with conscious life. It’s a cosmic coincidence that the density of vacuum energy and matter are nearly equal and that the universe’s expansion rate is nearly equal to the critical rate which separates eternal expansion from recontraction, and if the universe were significantly different, it would be impossible to develop conscious life such as humans who can contemplate their own universe. (In the context of the multiverse, there may be numerous universes but only a tiny fraction of them could support life.) It’s important to study the various coincidences and (im)probabilities in physics and cosmology in our universe, but it’s not clear what these considerations explain. David Brin spoke differently than the others, since he’s more a writer than a scientist, and his part of the discussion was always interesting. He frequently made interesting connections to fiction (such as a legitimate criticism of Walt Whitman’s “Learn’d Astronomer“) and he had a poetic way of speaking; when talking about the possibility of life beyond Earth, he said “If there are living creatures on Titan, they will be made of wax.” He also brought up the “Drake equation,” which is relevant in the context of the topics above. The Drake equation is a probabilistic expression for estimating the number of active, communicating civilizations in our galaxy. It involves a multiplication of many highly uncertain quantities (see this xkcd comic), but it’s nonetheless interesting to think about. The problem is that space is really big—”vastly, hugely, mindbogglingly big,” according to Douglas Adams—so even if there are Vulcans or Klingons or dozens or millions of other civilizations out there, it would take a really really really long time to find them and attempt to communicate with them. We could send people from Earth in a long shuttle ride to visit another civilization, but there’s no guarantee that humanity will still be around when they try to call back. It’s unfortunate, but this is the universe we live in.